Abrupt Jaunt — 5/day teleport up to 10 feet as an immediate action. Wizard (Conjurer) Focused Specialist (Conjuration), Immediate Magic (Conjuration), Specialization (Conjuration), Prohibited (Enchantment, Illusion, Necromancy), Bonus Feats, Spells, Slow Attack Bonus, Slow Skill Point Progression, d4 HD, Good Will Saves, and Poor Fortitude/Reflex Saves. 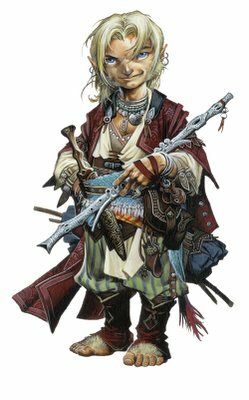 Rallon is an oddly dressed Halfling apprentice of Trevalis Academy who is always found wearing his rawhide long coat. While he always wears white linen shirts of simple make, his trousers are always striped but vary in colors. Upon his feet and ankles he wears simple rawhide slips that leave his furred toes free and comfortable. Apart from that, the rest of his attire varies depending upon what he expects from the coming day. Due to the amount of time he spends studying and practicing magic Rallon is not very skilled at climbing, jumping, and springing. He does however is quite durable and swift of reflex and seems as if he could easily run a marathon without magical aid if he was forced to participate. His long pale blonde hair is always messy. He has gentle sea blue eyes and a sharp featured face that often holds an inquisitive expression. In spite of being somewhat bookish, he spends just as much time outdoors and has walnut toned flesh from the hours he spends in the sun. 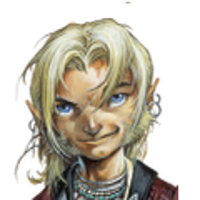 When speaking to others Rallon’s Halfling nature comes out the most, using grand gestures and flourishes to accentuate his words. Born to Pasha and Byron Fizzlepuck in the Killian Freehold, Rallon grew up helping his mother with the tailoring and mending of clothes when not helping his father work the small plot of farmland behind their home. His daily works helped him to build up endurance and cleverness to make up for his lack of physical strength. He once had an older brother named Vallon, though he only has the scarcest of memories of him as he left home while Rallon was still young to satisfy his wanderlust. Afraid that Rallon would follow the same path in admiration of his brother, his mother and father told him that Vallon had died when asked why he never returned home. Rallon has never met any of his extended family as it was only his father and mother that took residence in the Killian Freehold. While the signs were there that he had natural talent for magic, Rallon did not discover that he was already using magic until he met a travelling bard. Inspired and awed by the bard’s fancy stage tricks, he attempted to perform the same feats and found that he too was capable. 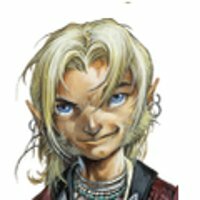 Impressed by Rallon, the bard gave him some informal instruction in magic and a lustrous twin headed golden coin before moving on. Realizing that they could not keep Rallon’s natural curiosities in check, his father and mother saved up money and sent him to Trevalis Academy where he received more formal training. While there he took instruction in Abjuring, Conjuring, Divining, Evoking, and Transmuting. Having distaste for Necromancy and Enchantment, he refused to take instruction in those arts. With his over the top imagination, his Illusions were often too obvious and revealed that he had no talent for the art, instead he focused specifically upon conjuring, calling, and creation. While there, he learned to read and write, enabling him to keep a book of spells. Rallon treats most everyone that he interacts with as if they were an old friend and thus does not differentiate between friend and acquaintance. He isn’t easily upset by others’ actions as he does not really see things in black and white but in varying shades of gray, so he is very slow to call anyone an enemy. Rallon however is married to and only in love with magic almost to the point of obsession, always looking for the next new spell. In spite of this obsession he would willingly give up on the quest to help a friend in need. Rallon does not follow any god though he does respect them and their authority and holds no grudge against those who do follow the gods. Because of his pragmatic approach to life and thirst for knowledge he refuses to subjugate himself to the views and persecutions of others that come with religious beliefs. To him, family and friends always come first with the pursuit of knowledge in a close second. He has no thirst for fame, wealth, or power and religion is always the furthest thought from his mind. Though he wants the freedom to explore magic and its uses, he believes that the use of it should be policed, especially Enchanting, Illusory, and Necromantic magic. Rallon has an obsession for uncovering new knowledge lost in old dusty tomes and texts, leaving him with a natural knack for searching and learning. He also has a talent for mending and crafting tailored goods of fair to exceptional quality. As with many wizards, he makes for a good source of information of all sorts but makes for a poor leader. He has no talent for commanding others as his talents all lay elsewhere. Rallon loves enjoying the company of good friends and new acquaintances, a good meal, and a warm fire. Though his nose is never far from a book he always has time for others and will separate himself from his studies to interact with others. Rallon absolutely detests those who use magic for extending their lives beyond their natural scope and is quick to help in the hunt of undead. He believes magic should be used to help others and maintain the balance rather than using it to serve himself. Rallon’s worst fear is that he will not live up to his own views on magic, knowing full well that power and corruption go hand in hand when not kept in check. Rallon was born in the Killian Freehold, raised on a farm until he was ten. After a chance encounter with a travelling magician and entertainer he discovered his own talent in the use of magic. Upon turning ten his father and mother sent him to the Trevalis Academy so that he could hone this talent into something more. Having recently graduated reached the age of fifteen he is now considered an adult and has moved to Avalon to find a way to make use of his talents for the betterment of others.